You might not have the whole world in your hands, but you can at least have it on your desktop with Xeric Design’s EarthDesk. The dynamic desktop software that displays a real-time map of the world on your desktop has been updated with support for dual graphics cards on newer Core i5 and i7 MacBook Pros, as well as a new projection that better conforms the map to your display. 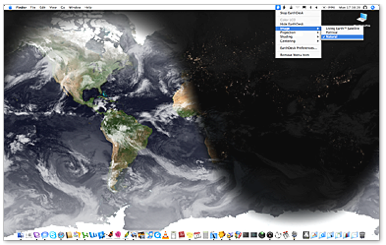 EarthDesk replaces your static desktop background with an image of the Earth, showing current sun, moon, and city illumination. Also included is real-time global cloud coverage, allowing you to track hurricanes and other weather systems right from your Mac’s desktop. EarthDesk 5.5's new ability to support dual graphics card in newer Core i5 and i7 MacBook Pros should allow it run smoother while affecting system performance less than ever. The 5.5 update also gives EarthDesk a new projection that better conforms the world map to the aspect ratio of your display. EarthDesk 5.5 costs $25 and runs on OS X 10.5 or later.